LaserWorld Guest Editorial, Nr 13 - 2000. The mangement of diabetic neuropathic ulceration by HeNe laser. LaserWorld Guest Editorial, Nr 14 - 2000. LaserWorld Guest Editorial, Nr 15- 2000. LaserWorld Guest Editorial, Nr 17 - 2000.
is it a feasible idea? laser therapy is all about. Please note that the dose is 0.4 J/cm2, not 4 J/cm2 as indicated in the text on the photos below. Treatment parameters for the diabetic neuropathic ulceration are given below : He-Ne Laser, wavelength 632 nm. Continuous Wave Beam Area(cm2)= Diameter(cm)2 x 0.7854 = (3.1 x 3.1) x 0.7854 = 7.547 cm2 Laser Output Power = 5 mW= 0.005 W Laser Output Power(W) Power Density(W/cm2)= Beam Area(cm2) 0.005 == 0.0006625 W/cm2 7.547 Energy Density(J/cm2)= Power Density(W/cm2) x Time(sec) = 0.0006625 x 600 = 0.3975 J/cm2 = ~ 0.4 J/cm2. Treatments were given once a day, 5 days a week, totally for 4 weeks. By Levon Gasparyan, MD, PhD, Jerevan, Armenia. Currently the methods of laser and non-laser (incoherent monochromic, narrow-band or broadband) light blood irradiation therapy - the methods of photo-hemotherapy - are widely applied in the treatment of different pathologies. Direct intravenous and extracorporeal (with red, UV and blue light) as well as transcutaneous (with red and infrared light) irradiation of blood are used. Unlike the treatment mechanisms of local laser therapy, the medical effects of photo-hemotherapy methods are determined by predominance of systemic healing mechanisms above the local ones, increasing the functioning efficacy of vascular, respiratory, immune, other systems and organism as a whole. The method of HeNe intravenous laser blood irradiation (LBI) was developed in experiment and introduced in clinic in 1981 by Soviet scientists E.N. Meshalkin and V.S. Sergievskiy. Originally the method was applied in the treatment of cardiovascular pathologies. Some authors reported that the treatment possibilities of the method are very large and include the improvement of rheological characteristics of the blood and microcirculation, normalisation of parameters of hormonal, immune, reproductive and many other systems. HeNe laser (632.8 nm) is generally used for carrying out the intravenous laser blood irradiation (IV LBI). Usual parameters of blood irradiation procedure are: output power at the end of the light-guide inserted into a vein from 1 up to 3mW, exposition 20 - 60 minutes. Procedures are conducted on a daily base, from 3 up to 10 sessions on a course of therapy. It was shown, that IV HeNe LBI stimulates the immune response of the organism, activates erythrogenesis and improves deformability of erythrocyte membranes, has anti-hypoxic activity on tissues and general antitoxic influence on the organism at different pathological processes. IV LBI is used for its biostimulative, analgetic, antiallergic, immunocorrective, antitoxic, vasodilative, antiarrhythmic, antibacterial, antihypoxic, spasmolytic, anti-inflammatory and some other properties. IV LBI activates nonspecific mechanisms of anti-infectious immunity. Intensifying of bactericidal activity of serum of the blood and system of the complement, reduction of the degree of C - reactive protein, level of average molecules and toxicity of plasma, increasing the content of IgA, IgM and IgG in the serum of the blood, as well as decreasing of the level of circulating immune complexes are proved. There are studies on boosting effect of IV LBI on the cellular part of immunity (N. F. Gamaleya et al., 1991). Under influence of IV LBI the phagocytic activity of macrophages markedly increases, concentration of microbes in exudate in the abdominal cavity of patients with peritonitis decreases, reduction of inflammatory exhibiting of disease, activation of microcirculation are detected. The medical effect of IV LBI is stipulated by its immuno-corrective activity by normalisation of intercellular relationships within the subpopulation of T-lymphocytes and increasing the amount of immune cells in a blood. It elevates the function activity of B-lymphocytes, strengthens the immune response, reduces the degree of intoxication and as a result improves the general condition of patients (V. S. Sergievskiy at al., 1991). IV LBI promotes improving the rheological properties of blood, rising fluidity and activating transport functions. That is accompanied by increasing the oxygen level, as well as decreasing the carbon dioxide partial pressure. The arterio-venous difference by oxygen is enlarged, that testifies the liquidation of a tissue hypoxia and enrichment the oxygenation. It is a sign of normalisation of tissue metabolism. Probably, the basis of activation of oxygen transport function of IV LBI is the influence on hemoglobin with transforming it in more favorable conformation state. The augmentation of oxygen level improves metabolism of the organism tissues. In addition, the laser irradiation activates the ATP synthesis and energy formation in cells (A. S. Krjuk et al., 1986). Application of IV LBI in a cardiology has shown that procedures have analgetic effect, show reliable rising tolerance of patients towards physical tolerance test, elongation of the period of remission. It was proved that IV LBI reduces aggregation ability of thrombocytes, activates fibrinolysis, which results in peripheral blood flow velocity increasing and tissues oxygenation enriching. The improvement of microcirculation and utilisation of oxygen in tissues as a result of IV LBI is intimately linked with positive influence on metabolism: higher level of oxidation of energy-carrying molecules of glucose, pyruvate, and other substances. The improvement in microcirculation system is also stipulated by vasodilation and change in rheological properties of blood as a result of drop of its viscosity, decrease of aggregation activity of erythrocytes due to changes of their physicochemical properties, in particular rising of negative electric charge. Finally the activation of microcirculation, unblocking of capillaries and collaterals, improvement of tissue trophical activity, normalisation of a nervous excitability are take place (N. N. Kapshidze et al., 1993). IV LBI is recommended to apply before surgical operations as preparation for intervention, as well as in the postoperative stage, because the laser irradiation of blood has not only analgetic effect, but also spasmolytic and sedative activity. IV LBI procedures on patients with chronic glomerulonephritis allow overcoming resistance towards medicament therapy (glucocorticoid, cytostatic, hypotensive and diuretic drugs). IV LBI promotes rising of concentration of antibiotics in the focus of inflammation as a result of improvement the microcirculation in the focus of inflammation, as well as normalisation the morphology and functional activity of the affected organ as a whole. IV LBI procedures have found broad application in obstetrics and gynecology for activation the blood flow in utero-placental and feto-placental basins, for prophylaxis of the pathologies at delivery, for influence on inflammatory processes of inner genital organs. IV LBI normalises production of gonadotropins, improves microcirculation, elevates oxygen pressure in blood and in tissues, and so accelerates the process of regeneration and reparation. In order to explain the generalised and multifactor effects of IV LBI, its positive influence practically on all tissues and functional systems of the body, clinical effectiveness for the treatment of different diseases, some authors mentioned that the improvement of microcirculation after IV LBI is detected in all structures of central nervous system, but this improvement the most active in the hypothalamus, which has highly developed vascular system. The capillaries of a hypothalamus are remarkable for high permeability for macro-molecular proteins, which should even more amplify influence of the irradiated blood to subthalamic nuclei. So it is supposed, that IV LBI increases the functional activity of hypothalamus and all limbic system, and as a result the activation of energetic, metabolism, immune and vegetative responses, mobilization of adaptive reserves of an organism is reached. The application in clinics of the non-invasive and relatively simple method of infrared (IR) transcutaneous laser irradiation of blood becomes possible after development of suitable IR semiconductor laser diodes. For transcutaneous LBI lasers with red (630-670 nm) or near IR (800-1300 nm) irradiation band are applied. Laser light is delivered to the skin on a projection of large veins or arteries via special nozzles. Some recent studies suggested that it is possible to achieve the medical effect similar to effect of IV HeNe LBI, without intravenous manipulations - by transcutaneous laser blood irradiation (TLBI). The procedure of TLBI has the greatest application in children's practice. The method is founded on a relatively high permeability of the skin and hypodermic tissues for radiation of red and especially of IR spectrum. It is supposed, that the efficacy of 20 mW HeNe laser transcutaneous blood irradiation is equal to 1 mW HeNe laser intravenous blood irradiation. In the same time TLBI procedures are non-invasive and painless. Recently non-laser light sources are also applied for transcutaneous blood irradiation. Unfortunately, there are not enough qualified works on comparing medical and biological effects of IV and transcutaneous LBI to make the final suggestions about clinical equality of these methods. Brill (1994) suggested that the effects of the laser therapy depend on the method of irradiation. He considered, that the term "transcutaneous laser blood irradiation" is desorientating, as it skips the significance in definition of bioeffect of irritation of receptors of the skin and acupuncture points, dermal cells (including mast cells), aditional elements of the vascular wall and other formations, which are subject to the irradiation. Today there are no ground to consider, that the positive therapeutic effect of laser irradiation of skin is a result of influence only of that part of energy, which penetrates the skin and is absorbed by blood and its components. With good reasons it is possible to speak about transcutaneous laser irradiation, with indication of the place of delivery of laser light. Currently the methods of laser and non-laser (incoherent monochromic, narrow-band or broadband) light blood irradiation therapy - the methods of photohemotherapy - are widely applied in the treatment of different pathologies. H. Kost et al. (1986) offered blood irradiation with incoherent narrow-band blue light for the treatment of patients with ischemic heart disease and hypertensive disease. The drop in low-density lipoproteins and cholesterol content of the blood serum was determined. Further studies proved the broad therapeutic activity of the blue light blood irradiation procedures. In studies of medico-biological effects of extracorporeal blue light irradiation of blood V. I. Karandashov et al. (1996, 2000) detected dropping of viscosity of blood immediately after the reinfusion. The viscosity of the blood plasma also was reduced, but to less degree than viscosity of blood, and had correlation with concentration of blood proteins. All these have results in augmentation of flowability of blood and improvement of microcirculation. The changes of viscosity of blood and hematocrit are determined by intravascular dilution of extravascular fluid with lower concentration of high molecular weight proteins. After the completing the course of irradiation the viscosity of blood was always lower than it was before the treatment. The decrease of concentration of cholesterol, triglycerides, lipoproteins and glucose was also marked. Thus, the phototherapy by blue light did not damage the blood cells, but stipulated dropping of concentration of atherogenous lipids, glucose and bilirubin. The obtained alterations had tendency to increase and stabilisation at carrying out of a course of phototherapy. At the same time studies showed that blue light does not affect the rheological properties of the blood in vitro. The infusion of the blood irradiated with blue light had immunostimulative activity for patients with chronic asthmatic bronchitis. It was also shown that immediately after the infusion of irradiated blood all main parameters of respiratory function were improved, and the increasing of effect was detected during and after the course of treatment. Blue light blood irradiation therapy presents very good results in the treatment of different pathologies. It looks like it combines the best properties of both UBI and LBI procedures. Probably in the near future the blue light blood irradiation therapy will be used much more actively, than today. Editorial comment: We include a recent Chinese study on intra-vascular blood irradiation as an additional information. Abstract: To evaluate the effect and mechanism of Vascular Low Level Laser Irradiation Therapy on brain injury. In this study thirty-eight SpragueDawley rats received Feeney's brain impact through a left lateral craniectomy under anesthesia. Control and treatment group are set up. According to the time exposed to laser and irradiating postinjury, the treatment group is divided in four subgroups by design. Semiconductor laser was used with a power of 5mW to irridate straightly Rat's femur venous. The Y Water maze was used to assess cognitive performance. Superoxide dismutase(SOD) activity and the level of metabolic production of free radical MDA in Brain and erythrocyte were measured to determinate the level of free radical. We find Vascular Low Level Laser Irradiation Therapy can improve posttraumatic memory deficits. SOD activity is higher in treatment groups than the control group meanwhile the level of MDA is lower. These findings suggest that Vascular Low Level Laser Irradiation produced a significant reduction in free radical's damage to the brain postinjury. Tendinitis is a common disorder of the musculoskeletal system. Cardinal symptoms from the tendon are pain from increased tension like muscle contraction or stretching and pain on pressure. In an acute stage inflammation is the most common pathophysiological manifestation, while degeneration of the collagen structure is observed in subacute and chronic cases. However, the episodic nature of chronic tendinitis with increased pain after strenous use of the affected tendon, may indicate that inflammation also play a part at this stage. A succesful strategy of treatment should include reduction of inflammation and regeneration of collagen. In the laboratory several experiments have shown that laser treatment may have the potential to achieve both these goals. The findings of the laboratory also shows that these effects are highly dependent on dose. Treatment should be applied daily for at least five days to reduce inflammation, and for at least 10 days to increase collagen production. The clinical dose depends on several factors such as laser type, depth to target from skin surface, the type of tissue between skinsurface and target location and the volume of injured tissue. The various tendon locations have different characteristics that affects determination of dose. It must be added that there are only two clinical trials showing effect on tendinitis (rotatorcuff) with these lasers and that the dose recommendations for other locations are extrapolations and have not yet been tested clinically. Clinical results from seven trials suggests that pulse lasers overcome the skin barrier with less need for variation of dose for the different tendon locations. Red HeNe lasers (632 nm) are only recommended for superficially situated tendon disorders like epicondyitis and paratendonitis of the achilles or patellar tendon. Use of HeNe laser on rotatorcuff, deeply situated patellar tendinitis (jumpers' knee), plantar fascitis or carpal tunnel is not recommended, due to the poor penetration of visible red light. Editors note: The master thesis in Physiotherapy Science of Jan Bjordal is called "Low Level Laser therapy in shoulder tendinitis/bursitis, epicondylalgia and ankle sprain. A critical review on clinical effects". Division of Physiotherapy Science, University of Bergen. 1997. Part of this thesis can be found in Physical Therapy Reviews. 1998; 3: 121-132. "What may alter the conclusions of reviews?". LaserWorld Guest Editorial, Nr 16 - 2000. Rosane de Fátima Zanirato Lizarelli ; Marcelo de Oliveira Mazzetto ; Vanderlei Salvador Bagnato Instituto de Física de São Paulo, São Carlos, SP 13560-900. Brazil. Faculdade de Odontologia de Ribeirão Preto, Universidade de São Paulo, SP 14040-000, Brazil. Dentin hypersensitivity is the most common patient's complain related to pain. In fact, this is a challenge to treat specially if conventional techniques are used. The possibility to treat pain through a low intensity laser give us an opportunity to solve this important clinical problem without promote a discomfort to patient. The main point here is not if this kind of treatment is anti-inflammatory to pulp and/or biostimulatory to production of irregular secondary dentin. The most important point here is to understand how much energy is necessary to reach conditions where to tooth become insensible to external stimulus. Our double-blinded study compared a group without laser (Placebo) with five other groups where different doses at 660 nm low intensity laser were employed. The final conclusion is that for 660 nm laser therapy, the doses from 0.13 to 2.0 J/cm2 were more effective than the others. The follow up care in this study was of 45 days. The above is an abstract of an interesting study on dentinal hypersensitivity. The doses ranged from 0.13 to 8 J/cmsq per point, and 2 J/cmsq seems to be best. Although the predetermined doses in this study indicated 2 J/cmsq as an optimal dose, the authors also have the clinical impression that higher doses (e g 8 J/cmsq) could be used at the first session, then using less on the following sessions. This hypothesis was not tested in the above study, though. The parameters in this study were: 3 therapy sessions, 72 hours inbetween. 1 point at the apex, 3 points at the tooth neck, in contact mode. You will find Dra. Lizarelli in the Photo Gallery. Interview with Dr. Farouk Al-Watban of King Faisal Specialists Hospital & Research Centre, Riyadh, Kingdom of Saudi Arabia. Rats and mice have been used in laboratory research on the effect of Low Level Laser for wound healing for many years. Indeed, this was one of the first experiments on LLLT performed by Endre Mester in the late 60ies. Many such studies have followed; some positive, some negative. It has been difficult to explain the discrepancy among the different studies. Further, it has been claimed that rodents are not suitable for this kind of experiments, if the final aim is to use LLLT on humans, since the skin and healing process in the two species are so different. Porcine models have thus been performed, but rat models still prevail. Karu has also suggested (see previous Editorial) that experimental wounds in healthy animals, or humans, for that matter, are meaningless. If the individual is healthy, the wounds will heal rapidly and the immune system cannot be improved above optimal. The situation is very different in the clinical situation, where difficult-to-heal wounds are treated. That means that the immune system for one reason or the other cannot cope with the situation and that the laser would be able to trigger a healing of the wound. So diabetic rats have been suggested and also rats that have been subjected to X-ray radiation in order to depress the immune system. Recently a study on the effect of 635 and 690 diode laser on experimental burns in healthy rats was published in Lasers in Surgery and Medicine (2000; 27: 39-42) by Schlager et al in Austria. It was concluded that neither wavelength had any beneficial effects on the healing process. In an effort to better understand the confusing situation, we got in touch with Dr. Farouk al-Watban of the King Faisal Specialists Hospital & Research Centre in Riyadh. Dr al-Watban has performed very detailed studies on the effects of different wavelengths and doses on the above mentioned rat wound-healing model. Q: What is your own experience - is the healthy rat model a viable one for this kind of research? Al-watban FAH, et al (2000). Lasers in the life Sciences (in press) final form submitted October2000. Q: Then, which doses and wavelengths would you say are useful? A: In our experiments we tried the following lasers: HeNe (632.8 nm), HeCd (442 nm), Ar (514 nm), Kr (670 nm), 780, 830, and CO2, All of them give stimulation and inhibition. The optimum is 632.8 nm with 30% acceleration in days, followed by the Ar (514 nm). Reference 1 & 2 give the details: dose and wavelength and treatment schedule. Q: So in your experience, it is quite possible to heal even experimental wounds in healthy rats. If so, would you make an analysis of the Schlager study and try to find out what parameters might have influenced to negative outcome? A: We have to study from this paper the following parameters. 1.) Laser Spot and Burn Size: Their dosimetry used - 1.5 J/cm2, which is equivalent to 50 sec and 125 sec for 690 & 635 nm respectively according to their power. They do not mention the laser spot size. The burns size of 1.54 cm2, accordingly, the laser spot size should be at least 4 mm larger (which give 2.54 cm2 if its circular), since the healing in the loose skinned rodents by contraction, is more important thanfor humans. This they did not clarify and it could give a high error. 2.) Cage Loss: They did not mention the rat cage loss during the time of treatments due to reflection and absorption which is not less than " 7.01 % (for 670 nm); 7.07 % (for 632.8 nm), if they use Plexiglas cage type. Of course, without these special cages it is very difficult to control the animal movements during the irradiation. The Laser Beam should be perpendicular to wound or burn area. The above measurements of reflection and absorption should be done perpendicularly, otherwise it will be completely different. 3.) Skin Loss: They shaved the skin without following it with hair removal lotion to minimize skin reflection, which can reach to 78.34% loss (for 670 nm) and 74.19 % loss (for 632.8 nm,) and transmission of 5.08% for 632 and 6.32% for 670 for these rats if they use hair removal. Of course, it will be much higher if they did not. As I mentioned, the laser spot margin being higher than the burn size is a must. 4.) Accordingly, if we analyze their dose of 1.5 J/cm2, with above reflection and absorption data for cage and skin we should have 15.34 % absorption (for 670 nm) and 20.73 % absorption for (632 nm). These are the nearest wavelengths I have to their experiments, so the actual absorbed dose is 0.2301 J/cm2 and 0.31095 J/cm2 which is a very small dose. If we add the plexiglass cage loss it will give 0.213 and 0.288 J/m2, respectively. Most probably they could see the effect even with that very small dose, (which is almost nothing). They could get the acceleration of wound healing in days of approximately 1 to 1.5 % if they calculated as follows. Where TD & CD are the days required for 80 % wound healing on the treated and control animal, respectively. The reason for 80% is to skip the personal confusion of measurements in the last days of healing. See reference one for detail calculation. They also could measure from that graph the % of wound healing acceleration in size reduction, which could be attributed to faster granulation and usually give higher % than the acceleration in days. See reference for calculations. Q: Do you think that the negative results could come out of inhibiting dosage? A: I do not think they reached to inhibitory accumulative dose since their doses are too small for these animals. Most likely, they are very near to zero bioactivation. The phenomena is very clear in healthy animal and they possibly could get at least 15 % acceleration in day and 35 % acceleration in size reduction if they follow the right procedure, measurements and dosages according to reference 1 & 2 for nearest wavelength to their used one.. This will apply for wound healing and since the repair mechanism is not very different from the burns. Most probably if their size of laser beam is the same as the size of the burns area, which even more will hide and complicate the effect completely. It requires larger size to include healthy area since to these loose skinned rodents' healing by contraction plays an important role. Q: What's the final conclusion? A: If they use incident dose of up to 20 J/cm2 for these wavelengths, they will be surprised, and in that case, they should be aware of the inhibition for accumulative dose. 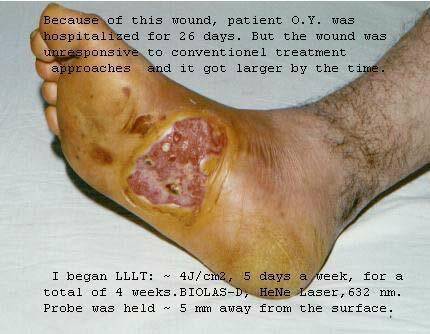 We know that the healing effect is optimum 3 times/week for 12 to 15 days depending on the size of wound. We make wound small to avoid growing of hair for a long time which even with cream the reflection loss reach to a phenomenal value. As I said it averages at 78 % at these wavelength when shaved and hair removal cream used. So in conclusion, the method of measurement, calculation and treatment is very poor. So it does not show the effects at all. Also, the 690 and 635 are too near to have most probably the same effects according to their fibroblasts absorption spectrum. Taking into accounts that these are diode lasers, their spot could be ellipsed rather than circular? If so, the covering of the wound is probably not aligned. Q: Are you planning any burn studies in your own laboratory? A: Currently, we are planning some experiments on the burns and when we finish, I could give you more and full details. Q: For the record: how many rats are now in your lab? A: Since King Faisal Specialist Hospital and Research Centre has the Animal Facility breeding the rats, we designed new experiments for studying the burn/1st degree, 2nd, 3rd-degree. We asked for 1854 rats to cover this experiment which includes the induction of diabetic rats for burn healing. In the past, we used approximately up to 400 rats for wound healing experiments on oval thickness wounds. Larger number enables excellent statistics to see phenomena which are impossible to experiment with in humans. Q: How should we extrapolate your positive rat model into the human clinic? A: Reference 1 & 2 give the details of calculating the actual dose which is the incident dose - (minus) cage loss dose - (minus) skin reflection dose. This actual dose could be transformed clinically by adding the dose of human skin reflection dose of 4 to 7% to cover spectrum from 250 to 3000 nm. Q: You have a web page full of information, what is the URL? Antipodean perspectives of the World Association for Laser therapy (WALT) Conference, June 27-30, Tokyo, Japan. Summary of the significant articles from WALT 2002. By Bjordal- Jan M.*, Couppe-Christian, Ljunggren-Elisabeth A. By Dr. Andrei P. Sommer. The Cochrane analyses - can they be improved? Low level laser therapy (LLLT) - Does it damage DNA? 100 positive double blind studies - enough or too little? LOW LEVEL LASER THERAPY IN DENTISTRY - PREVENTIVE PERFORMANCE. Chemo-induced mucositis. Results of multicenter phase III studies. LaserWorld Guest Editorial, Tiina I.Karu - April 1999. HOW TO FILL UP A GAP?